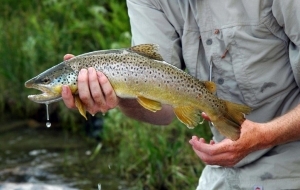 Fishing above the Hotel Owl restrictions (above Maiden Rock) offers longer floats translating into more fish. Tricos, a smattering of spruce moths and caddis offer enough dry fly fishing for purists. (Sizes 16 to 18). When in double-doubt, a Big Hole Crawler or Zonker. The mornings are leaning to September which will revitalize the water and the trout.